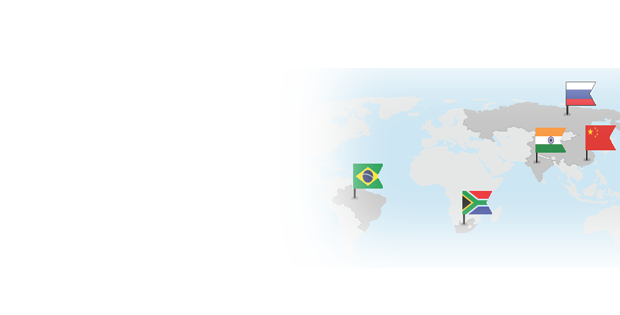 In July, leaders of the five emerging market countries known as the “BRICS” (Brazil, Russia, India, China and South Africa) met in the Brazilian city of Fortaleza and announced the creation of a New Development Bank (NDB). Interestingly and significantly, the announcement coincided with the 70th anniversary of the Bretton Woods agreement, which created both the International Monetary Fund (IMF) and the World Bank. 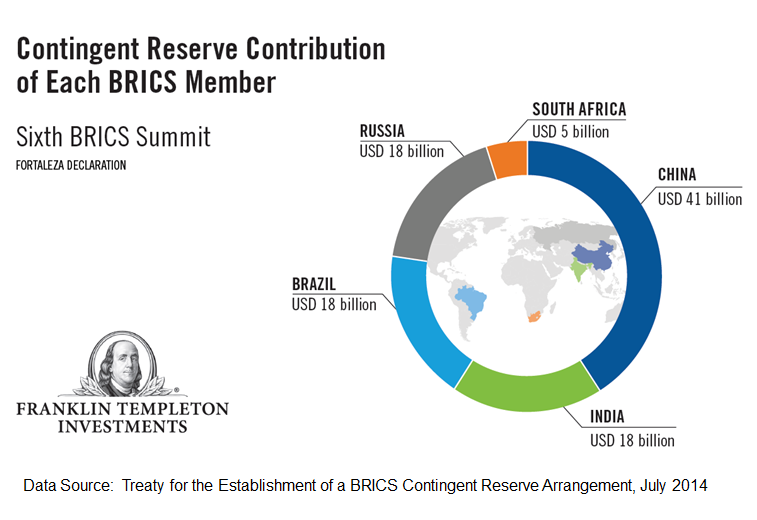 The new BRICS bank would offer a financing alternative to both entities, with initial subscribed capital of US$50 billion for financing infrastructure and sustainable development projects and US$100 billion in a Contingent Reserve Arrangement (CRA) to provide assistance to members experiencing financial difficulties.1 Officials have stated they would like to launch the first lending activities in 2016. In theory, the NDB could prove quite beneficial for the global economy, but how it will work in practice remains to be seen. The United States and Europe have largely dominated the leadership of the World Bank and IMF, and those in the emerging world have expressed frustration at a lack of broader representation (including voting rights). While still much smaller in size than either the IMF or World Bank at the outset, the NDB could provide a vehicle for that kind of representation. And, the reality is that major countries around the world are concerned about the dominance of the US dollar as a reserve currency and as the currency in which major trade takes place around the world. That dominance puts the United States in a strong strategic position particularly when it comes to sanctions, something that is playing out currently amid the Russia-Ukraine crisis. I think the initial impact of this new development bank for emerging markets is that many countries could have a new source of financing for infrastructure projects that they may have not had available otherwise. Going forward, as the bank likely evolves to become a clearing house for trade finance in non-USD currencies, there could be gravitation toward different currency pricing for trade in emerging markets. Traders and investors will therefore likely have to rethink their risk models in regard to currencies. If the BRICS countries are able to achieve unity of purpose, this group and its new development bank could become very powerful in changing the global financial landscape. Of course, the big question is their ability to achieve unity. The capital for the bank will be divided among the five participating countries, although the economies of the countries are clearly not identical in size, and some may be more vulnerable (or dominant) than others at times. That is important, because the richer countries will likely be more dominant and the fact that China is the largest holder of foreign reserves will be a decisive factor, in my view. China will make the biggest contribution to the CRA — $41 billion. It is no surprise that the bank will be headquartered in Shanghai. Compared to the global banking system, the start of this new bank is small but we need to keep an eye on further developments. Can these very different economies pull together in a unified way to make this endeavor a long-term success? That is the big question mark. These economies are different, with different histories and different cultures. Since China is the richest of the five, I think there will definitely be some concern about China taking a dominant role. In the beginning, China and India—the bank’s first president will be Indian—will likely play the largest role and have the potential to reap the most benefits from its success. Further ahead, Russia and Brazil could become more important; the first chair of the Board of Governors will be from Russia and the first chair of the Board of Directors will be from Brazil. The NDB Africa Regional Center will be established in South Africa concurrently with the headquarters, according to the Sixth BRICS Summit declaration. South Africa has the best infrastructure in all of Africa and has the potential to lead the entire continent to a new level of growth. There are still issues that will need to be ironed out to make this a successful enterprise: primarily, what currency will be dominant and whose objectives the bank will have in terms of its lending policies. It remains to be seen if this effort ultimately turns out to be a good or bad idea. If these countries can come together to make this new bank a success, many other emerging markets could reap the benefits. If there are greater flows of funds to the emerging markets and particularly the BRICS, I believe this can be good for all of the world’s economies who trade extensively with them. Dr. Mobius’s comments, opinions and analyses are for informational purposes only and should not be considered individual investment advice or recommendations to invest in any security or to adopt any investment strategy. Because market and economic conditions are subject to rapid change, comments, opinions and analyses are rendered as of the date of the posting and may change without notice. The material is not intended as a complete analysis of every material fact regarding any country, region, market, industry, investment or strategy. All investments involve risks, including possible loss of principal. Foreign securities involve special risks, including currency fluctuations and economic and political uncertainties. Investments in emerging markets, of which frontier markets are a subset, involve heightened risks related to the same factors, in addition to those associated with these markets’ smaller size, lesser liquidity and lack of established legal, political, business and social frameworks to support securities markets. Because these frameworks are typically even less developed in frontier markets, as well as various factors including the increased potential for extreme price volatility, illiquidity, trade barriers and exchange controls, the risks associated with emerging markets are magnified in frontier markets. Currency rates may fluctuate significantly over short periods of time and can reduce returns. 1. Source: Sixth BRICS Summit, Fortaleza Declaration, July 2014.